Pick a particular aspect you want to explore in your practice. This could be exploring size, spacing, colour, contrast, posing, exaggeration, stroke thickness, or anything to focus on and play with during practice. If you pick playing with size, for example, try to change up the size of things you are sketching in your practice. What happens if you sketch much smaller than usual…or much bigger? How do your sketches change when you mix shapes of very different sizes? How do different proportions influence the meaning of your sketches? Etc. Once you picked your focus, go wild. Try out a lot of different things. Go broad, go deep. Dive into the details. Experiment. Practice gives you the possibility to really experiment without the pressure of the result having to be good, usable or appropriate. You want to push out of your comfort zone, push things until they break. 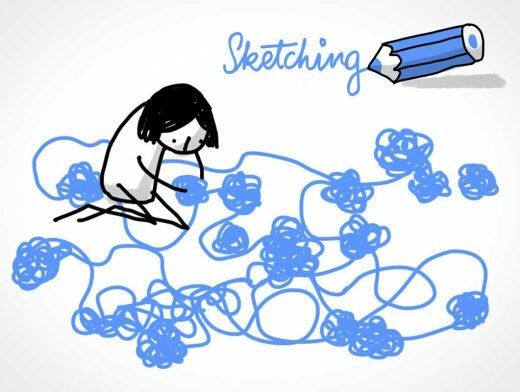 Like that you can explore the boundaries of what you usually do and you will probably make some interesting discoveries that usually don’t happen in your regular work when you focus on solving a problem and producing a piece that solidly ‘works’.